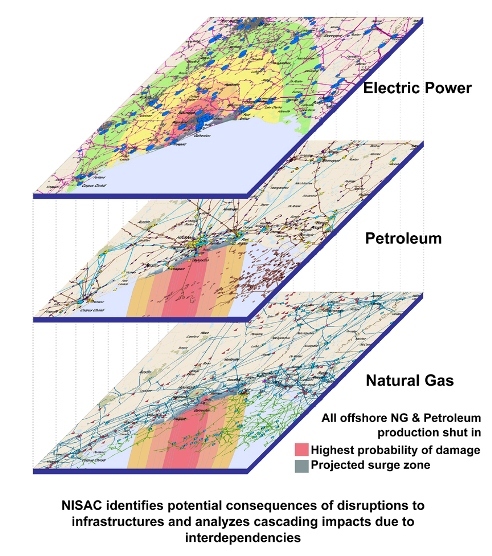 ~ ~ ~ EPC Updates ~ ~ ~: NISAC? "...provides advanced modeling and simulation capabilities for the analysis of critical infrastructures, their interdependencies, vulnerabilities, and complexities. NISAC is a partnership between Sandia National Laboratories (SNL) and Los Alamos National Laboratory (LANL). It was established in the year 2000 to integrate the laboratories’ expertise in the modeling and simulation of complex systems for evaluating national security problems." Comment: If you hang around the water cooler long enough with folks in the Federal government who are responsible for dealing with "big, bad and ugly", sooner or later you will hear the term "reachback". Reachback is a way of saying if personnel in the field need expert advice, there is an organization somewhere that has spent a lot of time and money to be ready for whatever has just been encountered. When it comes to disasters, infrastructure, and DHS - reachback equals NISAC.